I am fortunate enough to receive a product sample from Toys R US. The opinions expressed in this post are 100% of my own and any product claim. My 2-yr-old is a certified race car enthusiast amused by anything and everything related to cars. Sometimes though, like all other boys, he parks all his cars and pretends to be Handy Manny or Bob the Builder. This is why I was so happy to get a chance to review the Dump Truck Loader and The Forklift from Toys R Us. Each set contains a magnet infused technology to power up the vehicles. You have most likely already have surmised that MAGFORCE works through magnetism which means that no batteries are required to operate any of the components. Absolutely no batteries – Yey for the frugal mom! MAGFORCE works through magnet infused technology where MAGFORCE figures power up and operate the play set and the vehicles in it. My son is absolutely delighted by the chain reaction that occurs when he moves the two magnetic figures around the playset. There’s a elevator that goes up and down and garage doors that open and close. The magnetic figures can also raise and lower the vehicle. 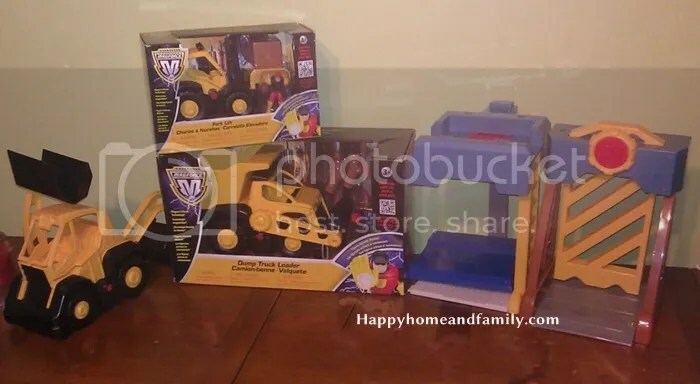 I’d have to buy more of the construction vehicles which cost between $5-10 each. The price really isn’t that bad compared to the scream of delight from my son’s face when he sees that he has new vehicles to expand his work site. Perhaps, we can start of with a cement mixer, a front loader, and a bulldozer to go with the dump truck. The MAGFORCE Central Command Center is certainly a welcome break from all the race cars the boys (yup, both my son and my husband) have been playing with. Who knows, this toy just might get my son interested to be an engineer or an architect. BUY IT at Toys R Us Follow them on Facebook and Twitter to get their latest promo and updates. I SO have to get this for my nephew – at 2 he is already obsessed with trucks and the idea that this would “operate” without him would be so thrilling for him. This is wonderful! It looks like a great toy that would get children interested in physics.